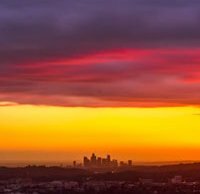 Photographer and educator Serge Ramelli recently used a ND10 neutral density filter to do long exposure photography at sunset in Los Angeles. In the video below, we join Ramelli as he shoots before heading back to his studio to run through both color and black and white editing processes for his long exposure images. When in the field, in addition to using a neutral density filter, you can slow down your shutter speed even further by using your camera’s lowest ISO and stopping your lens down further. While you may end up having to deal with some diffraction if you stop your lens down a lot, it could be a worthwhile tradeoff. After capturing some shots, Ramelli begins editing his images. If you’d like to follow along with the same images and get free photo editing presets for Adobe Lightroom Classic CC, click here. For more videos like the one below, head to Serge Ramelli’s YouTube channel.